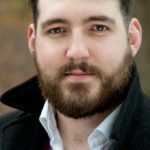 Bass-baritone Louis Hurst started singing as a treble chorister at Manchester Grammar School before studying at the Royal Northern College of Music where he was supported by Michael Oglesby, the Drapers Guild and the Musicians’ Benevolent Fund. He went on to participate in the ENO Opera Works Programme. His opera repertoire includes Yamadori and High Commissioner (Madama Butterfly), Dr Bartolo (Il Barbiere di Siviglia), Re di Scozia (Ariodante), Mr Peachum (The Beggar’s Opera), Luka (The Bear), Colline (La Bohème), Keeper of the Madhouse (The Rake’s Progress), Father (Hänsel und Gretel), Lion (Pyramus and Thisbe), (Lampe), King Ajax II (La Belle Hélène), Baron Douphol (La Traviata), and Sid and Billy Jack Rabbit (La Fanciulla del West). Louis has worked with such renowned conductors as Sir Mark Elder, Martyn Brabbins, Stephen Wilkinson, Nicholas Kraemer and the late Richard Hickox, amongst others. He has performed with Scottish Opera, Opera North, English National Opera, Grange Park Opera, the Mastersingers and at the Aix-en-Provence and Grimeborn Festivals. He has appeared in opera scenes with British Youth Opera, the Royal Northern College of Music and Young Opera Venture. He is a regular performer with several distinguished choirs at London’s Chapels Royal and in several cathedrals across the UK including the Savoy Chapel, Chapel Royal at Hampton Court Palace and St George’s, Hannover Square. Louis performed the Jailor (Tosca) for Grange Park Opera and most recently sang the role of Enrico (Lucia di Lammermoor) for Fulham Opera and appeared in Der Fliegende Holländer at Longborough Festival Opera.